Two-factor authentication adds a second layer of security to your Aframe account. When enabled, you&apos;ll need a code generated by an app on your phone/mobile device in order to log in from each new web browser or device. This means that even if someone manages to guess your password they&apos;ll still be unable to gain access to your media. Although 2FA can be added by a user individually at anytime, within their user profile page, to enforce 2FA across a whole account you will need to request this by contacting us here at Aframe. This is a one time only request, enabling the feature for all project users. When you sign up or sign in after 2 Factor Authentication is added to your account, you will be greeted by this message, simply click on the green &apos;Set up two-factor authentication&apos; button. 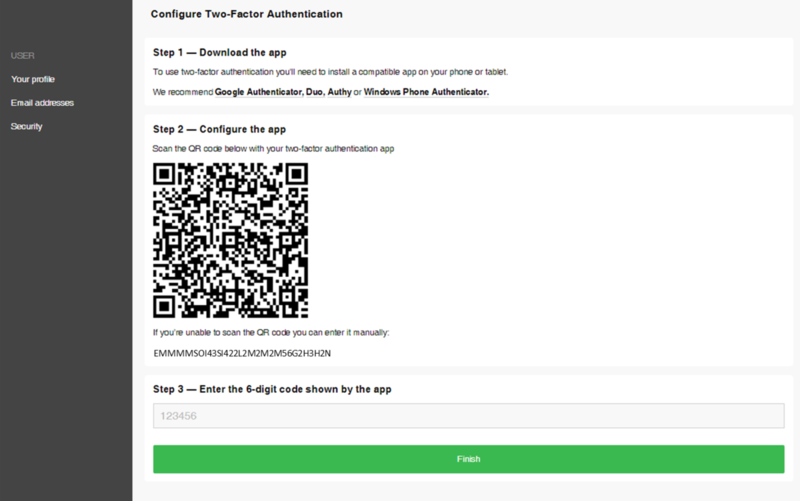 Once you enter your code or the scan is completed, on your mobile device, the app will provide you with a 6 digit code to enter on the screen above, this will sync your app to your Aframe login. Once you have synced your Aframe account to your authentication app on your device, whenever you sign in on a new device/browser, Aframe will ask you for your authentication code, which your authentication app will generate every 30 seconds or so. Note: Users viewing media via share links from an account that has 2 Factor Authentication will not be requested to set up 2 Factor Authentication, only project team members. For more help with this, please contact us or use the live chat session within Aframe.